Top 5 Reasons to Build a Composite/Synthetic Deck by Archadeck of Columbus. Archadeck of Columbus gives you the top 5 reasons to build a composite/synthetic deck. This composite/synthetic deck by Archadeck of Columbus says it all. 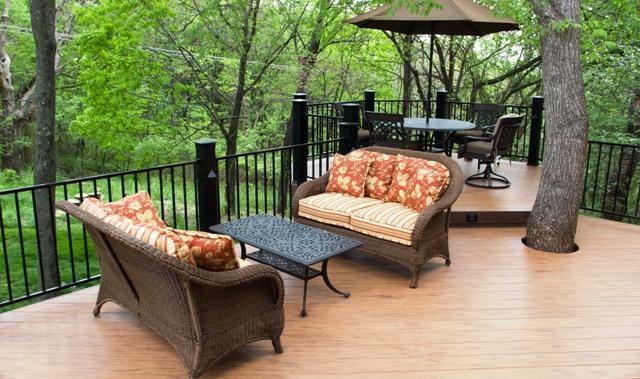 When considering which type of decking material to construct your new deck from the number of choices, this otherwise easy task can turn into a quite daunting one. It can seem sometimes like there is a little person on each shoulder, one of which is shouting “wood” and the other is shouting “composite”. Archadeck of Columbus is here to help you silence the shouting. Composite/synthetic is definitely the way to go for many reasons. The low maintenance, the beauty, and the consistency to remain looking like new are just a few reasons to choose composite/synthetic decking for your new deck. We have compiled a list of the top 5 reasons to build your new deck out of synthetics. The list is in no particular order of importance and was compiled to assist homeowners in making the daunting task of choosing their decking material a little easier. TimberTech's Earthwood composites have the look of wood without the headaches. 1) No staining or painting, ever– with any wood deck you’re going to need to take care of it. Wood is also a natural material therefore, eventually, with any wood, it will rot. 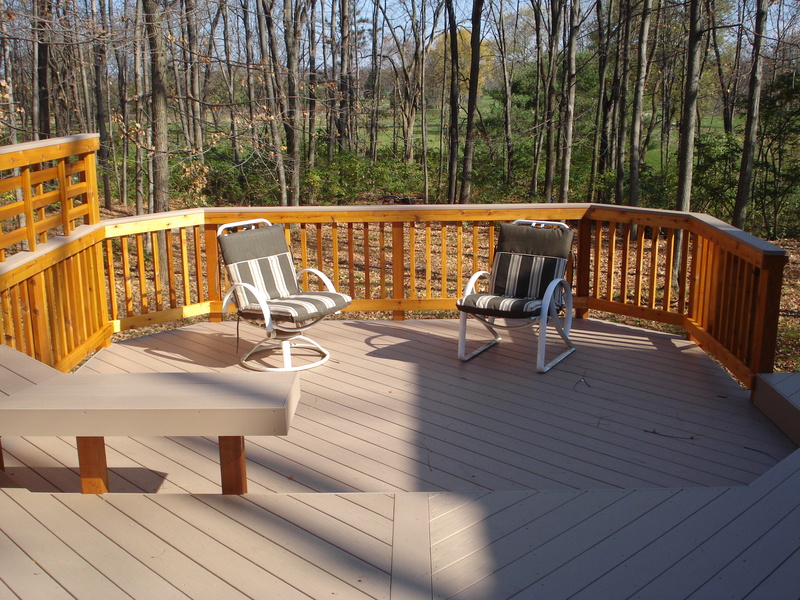 Depending on the deck’s location in relation to the sun, you might have to maintain a wood deck more readily if it is facing west with the sun’s rays beating down onto it constantly. Wood needs to be treated at a minimum of once per year. Wood decks also require power-washing to remove staining prior to sanding. It is also recommended to pre-treat a wood deck to ensure cleanliness before you apply any stain or paint. An average 300 sq. foot deck can cost between $500 to $900 per year to maintain properly. If your wood deck has a lot of details such as railings it can take a tremendous amount of time to stain or paint as well. 2) No more tweezer torture– Okay, we can all relate to this one. You or the kids get a splinter by simply walking barefoot across your wooden deck or one of the kids inevitably picks up a splinter every time they chase each other around the deck. You’re yelling stop running but it’s not because you’re scared of a fall. It’s because you dread putting your kids through tweezer torture to get splinters out. If your wood deck is not kept up to par, splinters will become an issue. Wood will move and expand with heat, and when it expands, it will not always shrink back and this causes splinters. Splinters can be a real headache, especially when you have to get out the tweezers to painfully remove the splinter and put yourself or your child through an instant replay of pain. Splinters hurt as much coming out as they do going in. Who wants a deck you can’t enjoy in your bare feet anyway? 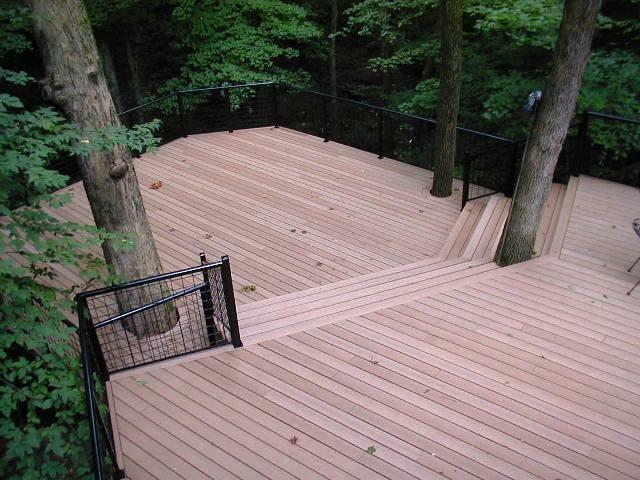 This composite/synthetic deck by Archadeck of Columbus will retain its beauty for many years to come. 3) What you see is what you get– Synthetics retain that “like new” color and feel , so what you see is what you will still have years from now. Synthetics won’t fade like wood. Wood can fade gradually and over time you no longer get what you paid for, sort of like that expensive pair of designer jeans that fade out in the wash over time, one day you look down and think “wow” what happened? 4) 15 year warranty for wood VS 25+ year warranty on composite/synthetic– This one is really a “no brainer”. Usually the 15-year warranty on wood has a clause about “normal wear and tear”, which includes the pains of naturally aging wood like splintering, twisting, cupping, checking not to mention the other aches and pains of naturally weathering wood like fading among others. Today’s composite/synthetic decking has a 25+ year warranty, and they’ve only been around for close to 20 years, so the product could exceed the warranty by years beyond that. This AZEK deck entails quality, beauty and a warranty to match. 5) A smart investment– If you’re making an investment in your home, it should be a smart investment. You wouldn’t buy a brand new car only to anticipate the transmission falling out after only 1,000 miles would you? Of course not, then why invest in a deck that is going to decay and fade over time when you can invest in a deck that will be like driving it off the showroom floor in 10 years? 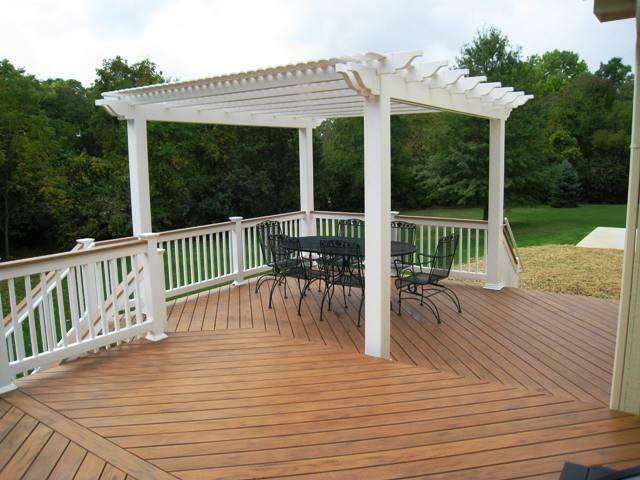 westcolumbus@archadeck.net We can create a deck that is made to enjoy, not to constantly worry about maintaining. Previous Previous post: At Archadeck of Columbus, a picture is worth 1,000 words.